The Mike Casey Trio is making its mark in the New York City jazz scene, with new music and several recent live performances. 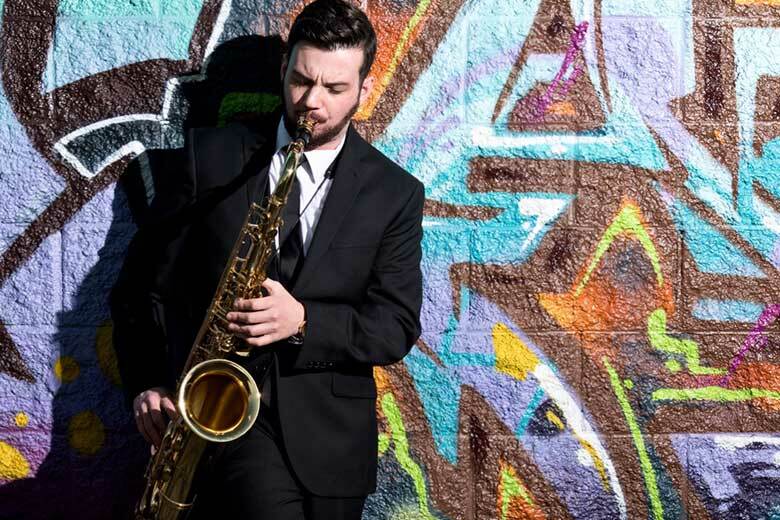 And later this month, this trio of young performers, who met while studying at University of Hartford’s Hartt School, will bring their fresh sound to BRIC JazzFest, and saxophonist Mike Casey hopes to surprise some folks with the trio’s sound. “I love that format—sax, bass & drums—and what I love to do in that format is surprise people,” he explained. “A lot of folks don’t expect to like [trios] as much, because there’s no piano or guitar. But then they hear us play and we focus a lot on melody and rhythm—and they’re into it.” The Mike Casey Trio will perform on Thursday, October 19, at BRIC JazzFest, with Mike Casey on saxophone, Matt Dwonszyk, on bass and Corey Garcia on drums. Mike is 24 years old, but boasts an envy-inducing resume. He has played saxophone for 15 years—both alto and tenor saxophone—and started to perform with Marc Cary’s ensemble the summer after graduating from Hartt, at venues including Cape May Jazz Fest, Summer Stage and Lincoln Center Atrium. Mike, who feels equally at home on alto and tenor sax, and said that he not only writes music for both, but that if given the opportunity, he will perform one set on each instrument at a show. “Usually saxophonists settle in on one, but I don’t think that will happen for me,” he said with a laugh. In 2016, the Mike Casey Trio recorded a live performance at The Side Door, releasing one album of songs in February of this year. The follow-up album with more songs from that recording will be released in spring of 2018, along with a tour. “I’m working on a bunch of new music and we’re hoping to premiere one or two pieces at BRIC JazzFest,” Mike said. “We did a Sofar Sounds show in Brooklyn this year and we put out a single from that show: Norwegian Wood.” The video for that single was just released this week. As an independent artist, Mike has to focus a lot of energy on the hustle of the industry, working to release music and book gigs--in addition to writing and performing music. See Mike Casey Trio at BRIC JazzFest Marathon Thursday, October 19, 2017, at BRIC House!